Iloilo City’s history is as colorful as it can be. However, sometimes it comes to a blur as part of it is told orally or has not been recorded properly. Several articles were written about the Charter Day celebrations but there are some conflicting information. One of the articles stated that July 16 is the day the charter signed therefore the inauguration happened later. Hence, the search for facts led to the discovery of some important documents pertaining to the city’s charter day. Full copies of the original and amended charter of Iloilo City as well as presidential proclamations were found. These documents as well as notes from local personalities can help us understand what has transpired in 1937. The Commonwealth Act No. 57 known as the Charter of Iloilo City was enacted into law on October 20, 1936. It established the City Government of Iloilo with the Mayor as an appointed position by the President. The territory comprises the then the town of Iloilo, which incorporated the towns of Molo and Mandurriao in 1903. Iloilo City was born with the signing of the charter by President Manuel L. Quezon after the National Assembly had created the four cities of Iloilo, Cebu, Zamboanga and Davao. Present at the ceremony last October 20 were Assemblymen Pedro Gil, Tomas Confesor, Victorino Salcedo, Ruperto Montinola, Jose Zulueta, Speaker Gil Montilla, Sec. Quirino, Jose Aldeguer, and newspapermen from Iloilo. A few weeks later, the Charter was amended as Commonwealth Act No. 158 on November 9, 1936. The amended charter now includes the territories of the Municipalities of Lapaz and Arevalo to Iloilo City. Local historian Nereo Lujan has noted that the town of Iloilo in 1936 has not reached the required population of 50,000. It was the reason why the charter was amended later to include the two towns. Furthermore, Commonwealth Act No. 158 Article XI Section 2 specifies that the City of Iloilo shall begin to exist on either two conditions. One is after the elected provincial and municipal officials of the province of Iloilo has assumed office after a general election. Secondly, if the elections were postponed on a date later than 1937, the inauguration date in set on July 16, 1937 with the appointment of city officials by the President and concurrence of the Commission of Appointments of the National Assembly. No general elections were held in 1937 thus Proclaimation No. 133, series of 1937 was signed on January 23, 1937. It set aside the inauguration of the City of Iloilo on July 16, 1937 as prescribed in Commonwealth Act No. 158. However, no inauguration occurred on July 16, 1937 as there was still no city official that has been appointed. Hence, the provision of Article XI of the Commonwealth Act No. 158 has not been satisfied. Mr. Ben Jimena, in an article in The News Today, wrote that there were 24 persons interested in the position of Alcalde or City Mayor. Eventually, it was Dr. Ramon J. Campos who was selected as the forthcoming mayor. On August 20, 1937, Proclaimation No. 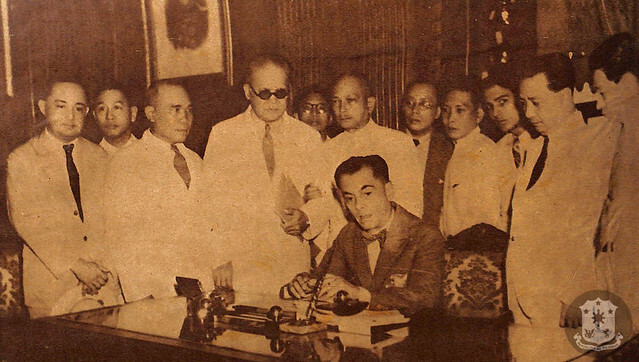 172 was signed by President Manuel L. Quezon. It sets August 25, 1937 as the inauguration of the City of Iloilo and declared it a public holiday. 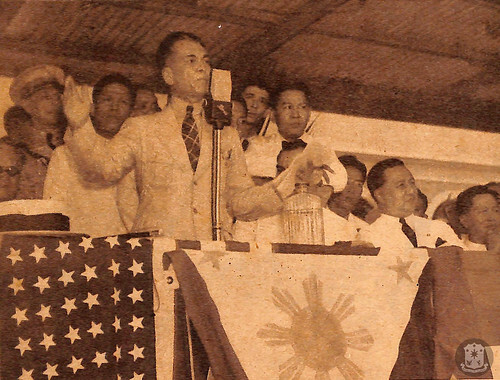 Dr. Ramon F. Campos, right, taking his oath of office as mayor of Iloilo City in the presence of President Quezon, Secretary Elpidio Quirino and others. Finally, on August 25, 1937, Secretary of the Interior Elpidio Quirino swore Dr. Ramon J. Campos to office as the first City Mayor. President Manuel L. Quezon then inaugurated the City of Iloilo. Thus, August 25 is the Charter Day of the City of Iloilo. The day that the charter took effect with the inauguration of the City Mayor. President Manuel L. Quezon delivering his speech. Iloilo on August 25, 1937 became a city with its inauguration. The annual Charter Day celebrations was instituted by former Mayor Jed Patrick Mabilog upon his assumption to office in July 1, 2010. It was a way to remember how the city has started to exists. The first charter day celebration was held last August 25, 2010. Since then, the activity was anticipated celebrations among the city residents and stakeholders. The City Government launched the celebrations for the forthcoming 81st Charter Day last July 30, 2018. Mayor Jose S. Espinosa III led the celebrations together with the members of the City Council and Vice Mayor Jeffrey Ganzon. A civic parade was held around Plaza Libertad which was participated by the different city government departments as well as representatives from public and private schools. A grand “Pagulikid sang Syudad” was held at Plaza Libertad after the opening ceremonies. Festive Parade at the Opening of the Charter Day Celebrations. Students from the public school drum and lyre participated in the opening ceremonies. This years’s charter day theme is “Pagulikid kag Pagtib-ong: Fostering Local Community by Strengthening Global Connections”. In relation to this, the City of Iloilo has also signed a letter of intent for a Sister Cities Pact with Quanzhou City of the People’s Republic of China in the afternoon. More activities are coming this month with the Sister’s Cities Night, the Double Dragon’s Dragon Boat Race and the Charter Day Parade on August 25, 2018. Public Laws of the Commonwealth: Enacted by the National Assembly. Google Books. Jimena, Ben. Iloilo City Charter Day What Happened in 1937. August 25, 2010. The News Today. Nereo, Lujan. History 101 Charter Day of Iloilo City.